When disaster strikes, you’ll need a board up company to respond with the necessary tools and manpower to secure your property to prevent further loss from happening. 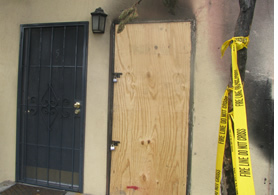 The Board Up Company has the necessary skills, to address any property burn out situation. We’ve performed countless emergency board ups throughout the years and have seen it all. The Board Up Company arrives promptly, with a can do attitude, fully stocked with lumber, roof tarping materials, padlocks and slide bolts to secure front entry ways allowing future access to contractors, and insurance adjusters.